Yesterday evening, the now modified Cozy front mount was re-installed and connected to the motorcycle front mount using the new DMC parts. With the relative position of the sidecar and motorcycle mount, the minimum lead is going to be 12% with the mounting parts completely collapsed. This mock up was to determine the location of the new crossmember and rear sidecar mount and I think I selected a location. I need to cut down the new crossmember and grind off the paint from the frame for welding. Once everything is welded/bolted in place and the initial alignment done, the excess metal on the two 70° bosses will be trimmed. At this point, the bike is still on the center stand so it is sitting a little higher than it would be when running down the road but I think that it may be close enough to go ahead and measure the front and rear struts. I was originally thinking that I would be able to re-use the struts from the Cozy universal mount (shown on the right) but only one strut was barely long enough and I would have to modify one end to fit. Plus, due to their design, they would be very difficult to adjust the lean (the amount from vertical that the bike is tilted). From what I've been reading, the initial setting for the lean is 2° out or away from the sidecar to compensate for the tendency for the sidecar to turn you to the right. 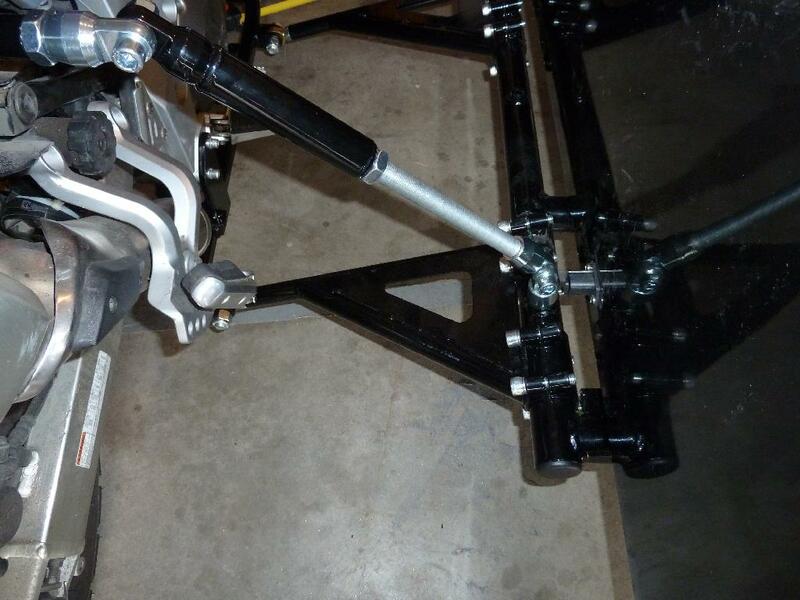 in case you are interested to see what the struts look like, Dom Chang has a picture posted of his rear strut installed on his Vstrom-Dauntless rig on his blog Redleg's Rides. You can compare the struts from the Cozy and the DMC struts on Dom's Vsrom rig. Quite a difference. 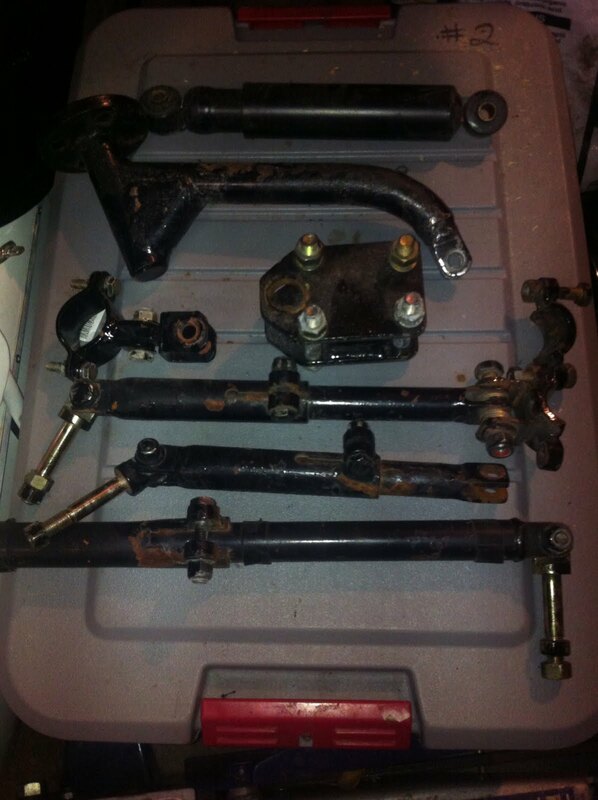 I should have just picked the struts up when I was in Enumclaw but didn't think of it. I ordered them from DMC this morning and I just received email from Jay letting me know that they were already in the mail. Very good customer service. On the local weather front, the temperature inversion is much more pronounced this morning. It was only -6°F this morning at our home which was about 35°F warmer than in the lower areas of town. Our home isn't that high in the hills so it is unusual for us to benefit from the inversion. By the middle of the day, a slight wind came up which is sufficient to eliminate the inversion and the fog started to dissipate. With your weather outside Frightful, your workshop feels cozy, even from way down here. It must be similar to Santa's? All the technical sidecar mount jargon is like a foreign language to me, but I wanted to say I am glad your weather warmed a bit. Now that the inversion is gone and the fog is blowing out will it cool down again? Now that the wind has died down, the temperature is dropping again. And once it has dropped to below -30°F, the inversion will slowly return along with the ice fog. All it took was a 1 mph breeze to get rid of the ice fog and the inversion. Yep, before I go to the compress suspension step, I need to get the new crossmember welded in and get some struts put into place. Otherwise it'll be difficult to even get started. I also need to get the sidecar body remounted after the new crossmember is in and painted. I have the new rubber body mounts for the sidecar in but not installed again until the welding is completed. 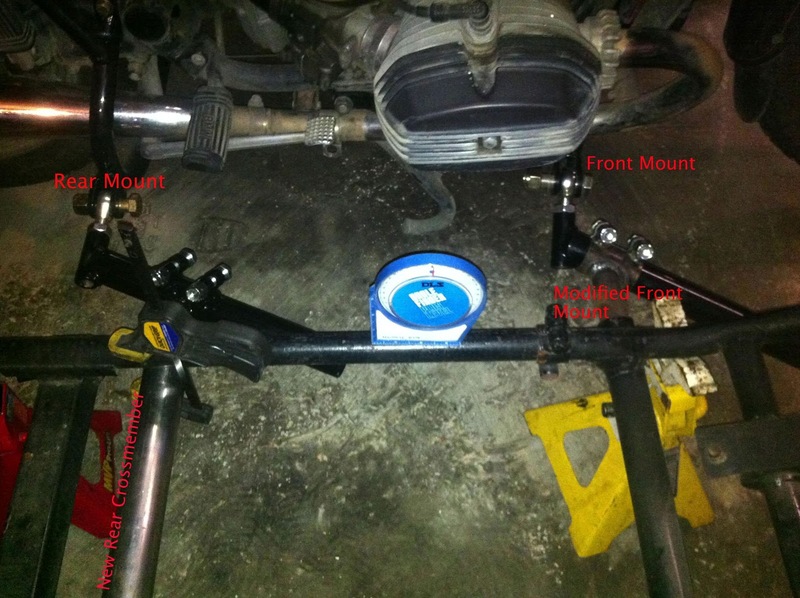 I am also going to weld in the strut mounting points on the sidecar since I don't have a lot of confidence in the bolt-on mounting points supplied by Cozy. I have been doing a lot of research at the locations mentioned including the "Yellow Book" and comments by David Hough on the BMWMOA forums regarding mounting. I was told by DMC to start at 2° lean out and 5/8" toe in but that would probably change depending on how it handles. I guess I still really enjoy this kind of thing. A chance to exercise my mind, so to speak. At least get to use a little of all of those physics and mechanical engineering classes. I'm with bob on this one. Oh my, the complexity. Still, I'm enjoying the process. It is most interesting to see this take shape. Actually, I'm enjoying the process as well. There are other maintenance tasks that I need to be working on as well but learning something new and figuring out how to do things like this are a lot of fun. I've enjoyed following your progress, and it will be neat to see the finished project. I've been joking with one of my older riding buddies about a 3rd wheel, either a trike or side car as he ages. He was quick to find some pictures of a Zx-14 with a spiffy looking side car on it. It got me thinking.. hummmm...??? Hopefully, there will be a rolling chassis by the 1st of the year and then I can start on things like wiring and alignment. I don't think it's going to get out of the garage until after things warm up a bit. ZX-14 with a sidecar, eh?